Vigilant Grandpa: Manhattan are rising...what about those vacancies?? Manhattan are rising...what about those vacancies?? anyone pretending that it doesn't exist. It's just dandy that asking rents for retail spaces in certain tourist-trampled parts of Manhattan are rising, as the Real Estate Board of New York reported yesterday. We're even told that since last spring ground-floor asking rents in Times Square jumped to $1,700 per square foot -- for a 21-percent increase since that time. To which most New Yorkers with eyes will respond: oh, please. And not just because asking rents often bear little relation to actual rents. While REBNY notes that "vacancies persist . . . beyond the popular and well-known shopping corridors," it omits what's obvious to any attentive pedestrian: namely, that oodles of vacancies exist within those supposedly white-hot zones as well. Worse, they're proliferating, even at heavily trafficked corners. What a miserable signal they send at a time when New York's status as world financial capital is jeopardized as never before. And how puzzling, given that most of the city enjoys a low crime rate and quality of life immeasurably improved over even 15 years ago. Manhattan's widespread, chronic store vacancies are far more numerous than in other major world cities and were so even before the financial crash two years ago. But the culture of self-congratulation in the retail-leasing industry is so entrenched, it's almost impossible to get an acknowledgement of how dysfunctional our retail climate can seem to even casual observers. The REBNY report is based on findings of an advisory board of -- guess who? -- retail brokers. They can hide behind fantasies of propaganda about European designers supposedly eyeing Manhattan, but they can't hide windows-full of "Prime Retail Location" signs. They're everywhere -- the whole Wall Street area, Bleecker Street, Third Avenue above 42nd Street, West 57th Street. At many prominent locations, stores remain vacant for years, lending an air of defeat. Think of the Eighth Avenue side of the new Hearst tower; the former Times Square Theater on West 42nd Street, where Marc Ecko walked away from a deal after tying up the site for four years; and huge spaces in the Flatiron district that have stood dark seemingly forever. 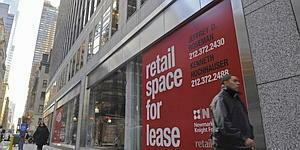 REBNY counts 110 million square feet of Manhattan retail space. Yet -- strangely for a trade organization so statistically astute -- it doesn't cite a vacancy rate. We'd guess that's at least 12 percent overall and far higher in certain parts of town -- astonishing in a city blessed with incalculably wealthy shoppers and probably the heaviest sidewalk traffic in the Western world. Vacancies were even higher in the late 1980s and early '90s due to a glut of overpriced space in new buildings, when developers needed to realize the unrealistic rents they promised banks in pro forma statements. But today, there isn't that much ground-level retail in new buildings.